After returning to Tokyo from my travels I was still able to catch the tail end of the lotus season, to my great joy. This was painted over 2 sessions at Shinobazu-ike, the lotus pond down the bottom of Ueno Park, though the photo is from the end of the first session. The changes are pretty subtle from this version. I notice that a lot of outdoor painters tend to spend one session on their paintings. I find that - for me, anyway, some paintings need more than one session to complete them. Weather and location permitting, I really enjoy returning to the 'scene of the crime' more than once to work on a painting. In those times, since most of the painting is already down on the canvas, I find I tend to work a lot slower and more meditative. I find myself 'listening' quietly, allowing the painting and scene speak to me, telling me what needs to be done (or what needs to be left alone). Sometimes this may only require a few subtle dabs of paint. Sometimes it's more. Perhaps one of the biggest challenges is to know when to stop. It's probably a lifelong process that one gradually gets better and better at. But I find the more deeply receptive I am to what the painting's trying to say to me, the better I am at knowing that moment. In that way it's like writing music or improvising - if you're writing you have to constantly listen inside to what's trying to come through, or if you're improvising, you need to be constantly listening to the music and the other musicians around you. Once you stop listening, you kill the music by enforcing your own. Or (with improvising) you kill the beautiful communication and energy between the musicians. Every musician knows what it's like to jam with others where there's at least one person who isn't listening but is off on their own tangent. It really kills it for the rest. Lately I find I'm starting see more and more similarities between music and painting. They tend to complement each other well and often cross over into the other, even blurring the boundaries at times. Having spent a lifetime working with one craft, I'm now finding there are skills I've learned musically that are really helping me with my journey into painting and seeing. It's quite fascinating, and also interesting to note that many artists are also musicians and vice versa. http://www.polamuseum.or.jp/english/index.php I thought you might be intersted. Cheers! Mr. B.
Mr B thanks, good luck with your ventures. Having just recently been at the Musee d'Orsey (at the time of that post) I wasn't upset that I missed your recommendation. Hi. I was looking for art blogs on Google and found you for my surprise. Your work is very inspiring for a beginer like me. 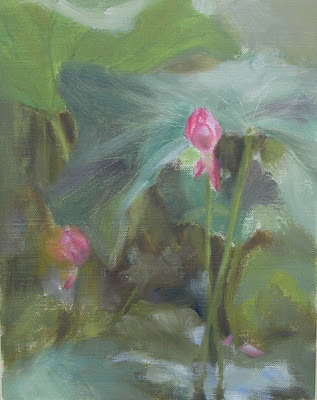 Your lotuses reminds me Monet! Well, thanks, congrats and happy holiday.